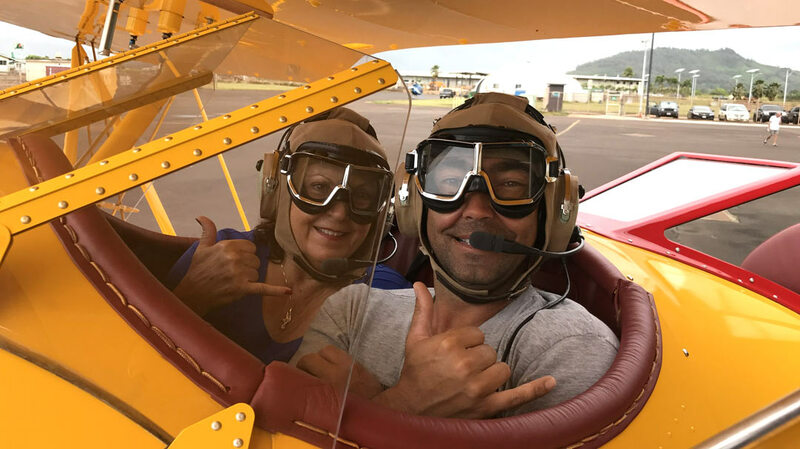 Kauai Air Tour by Open Cockpit Biplane! Book online and save $52.50 per flight! The total cost for two passengers when booking online is $472.50, with each passenger paying $236.25. Single passengers wishing to book are welcome to call us to inquire whether we can pair you with another single passenger wishing to experience this tour. Our YMF-5 WACO BIPLANE is specifically designed to carry a pilot and two passengers. While the pilot operates the controls from the rear cockpit, our passengers sit side-by-side in the cozy, yet comfortable OPEN cockpit. Each passenger has the option of wearing the nostalgic cloth helmet and goggles should they wish to. You will also enjoy two-way communication with your pilot with top of the line Bose noise cancelling headsets. Depart the Lihue Airport and fly over the sunny south shore, Kipu Kai (nicknamed the Baby Napali Coast), the 5-Star Grand Hyatt Hotel, the legendary Shipwreck Beach, Poipu Beach, Lawai Beach (where the home of Tattoo and Mr. Roarke in the hit TV series Fantasy Island is located), the Spouting Horn, and over to Hawaii’s largest coffee plantation (Kauai Coffee). 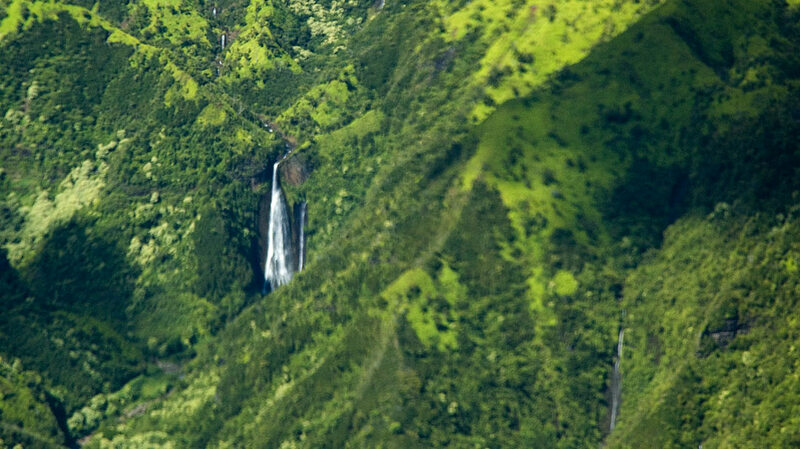 On to Hanapepe Valley where Manawaiopuna Waterfall is located which is also known as the Jurassic Falls, Olokele Valley, and Waimea Canyon (the Grand Canyon of the Pacific). 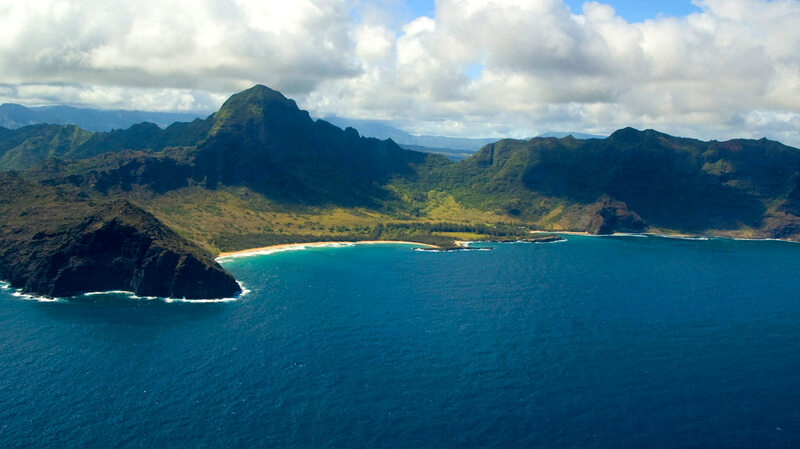 Descending over open fields to Polihale Beach (the largest beach in Hawaii at 16 miles long) and covering the Sacred NaPali coastline. 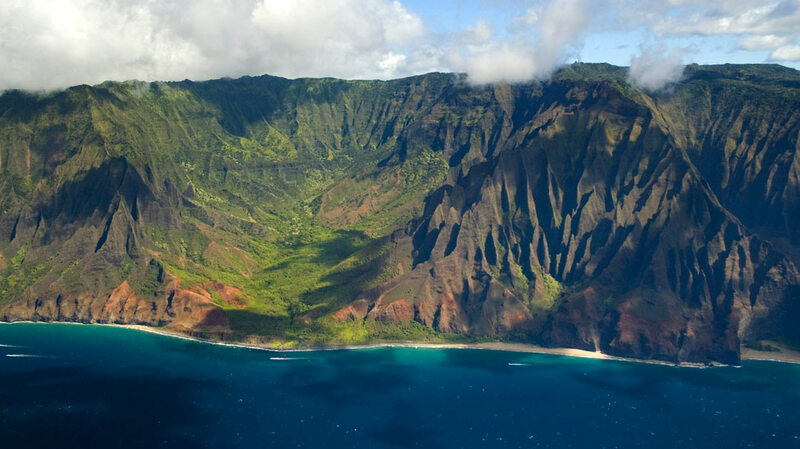 The 21 mile long Napali Coast consists of the Nualolo Valley (where up to 5,000 ancient Hawaiians lived up until 200 years ago), the Cathedrals of Honopu’u, the Honopu’u Arches (where numerous Hollywood hits were filmed), Kalalau Valley and Beach, and over to the lush Hanakapi’ai Valley with its cascading 3,000′ waterfall over to the secluded Ke’e beach located at the end of the road. Pass by the northernmost point in Hawaii, Kilauea Lighthouse, and see the sacred nesting spots of the Nene (Hawaiian goose). Soar up the Kilauea River with its mesmerizing waterfall as you head up the lush Hanalei Valley and experience its jagged 4,000′ cliffs. You will then continue on over the ridge of Mt. Waialeale Crater viewing more waterfalls than you can count and on to Kilohana Crater (the secondary volcano that helped to create Kauai). Fly down the Wailua River (the only navigable river in Hawaii), Fern Grotto and Sleeping Giant with its ancient Hawaiian legends. Pass by Coco Palms where Elvis made the romantic movie “Blue Hawaii”, then along the Gold Coast of Kauai and over popular hotels and beaches. 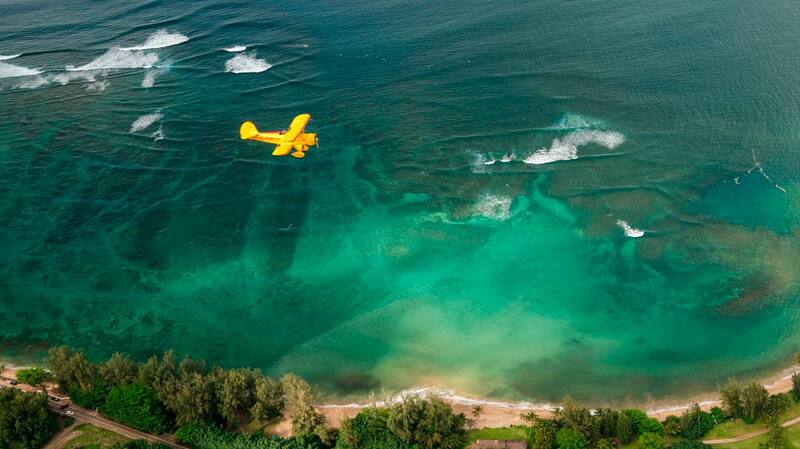 Fly over rustic Kapa’a Town and the pristine Keali’a Beach. 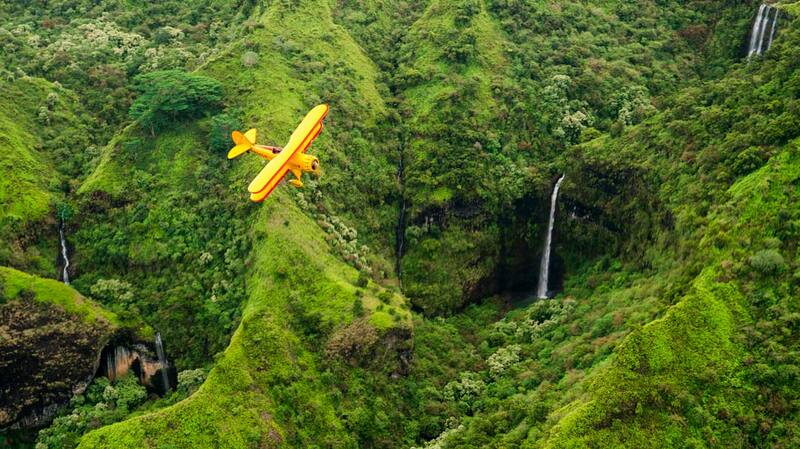 Glide along the Anahola Mountain range and view King Kong’s profile. 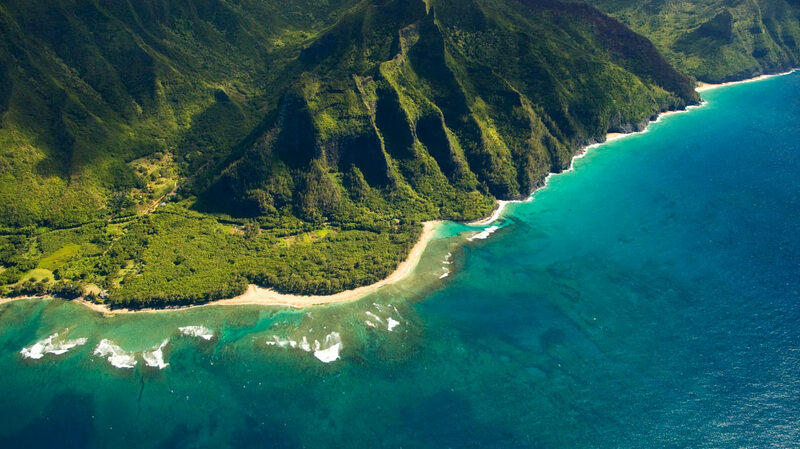 Then head down Wailua Beach, over Kauai Beach Resort, Kauai Beach Villas and View the Wailua Golf Course as you head back to the Airport. 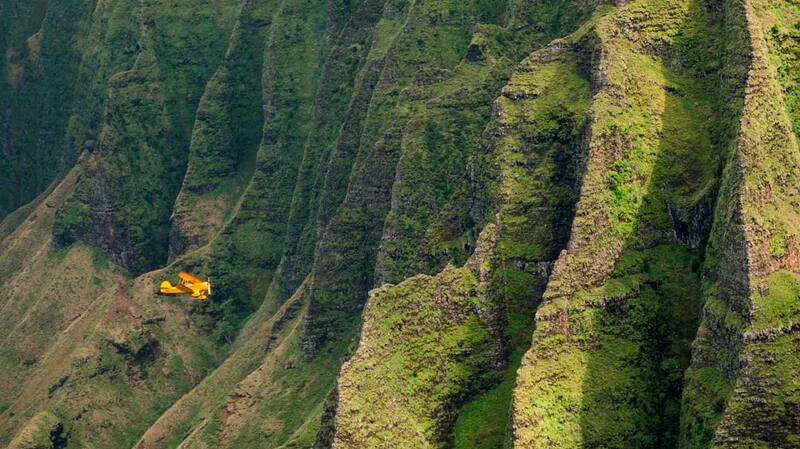 Just before landing you will see Hanamalu Beach Park where they filmed “6 Days, 7 Nights” starring Harrison Ford. 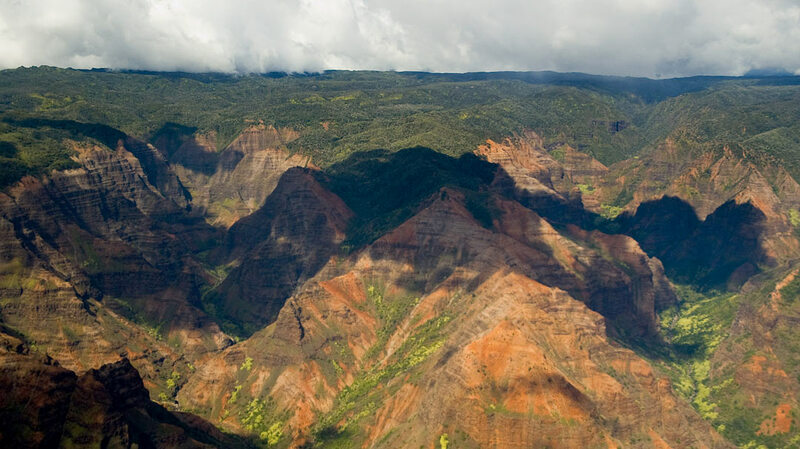 This tour is perfect if you want to experience the “ride of a lifetime” on Kauai! What type of clothing should I wear on the open cockpit Bi-Plane ride? We recommend you wear comfortable clothing. 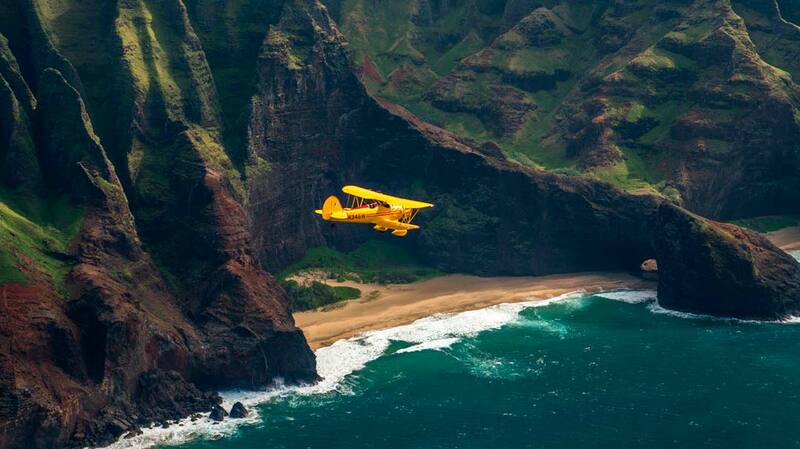 If you feel comfortable on the ground you will feel equally comfortable in the airplane. How many passengers does the biplane accommodate? Our open-cockpit biplane holds two passengers with side-by-side seating forward of the pilot.